Wall Street’s playbook stipulates that every down tick in the market is just another buying opportunity. While that is most often true, peak margins, a slowing global economy and the bond bubble collapse makes this time more like 2008 than just a routine selloff. In the vanguard of this coming market crash is China, whose make-pretend growth rate slid to 6.5% in the third quarter. This is the slowest pace of growth that the communist government has been willing to own up to since the last global financial crisis. Leaving one to conclude that the reality in China is far worse. This sluggish growth and a near 30% plunge in Shanghai shares prompted swift action from the Chinese government, which announced plans to cut personal income taxes and cut the Reserve Requirement Ratio for the fourth time to encourage more leverage on top of the debt-disabled economy. The government has even bought ETFs to prop of the sinking Chinese stock market. As a result, shares recently surged 4% in one day. 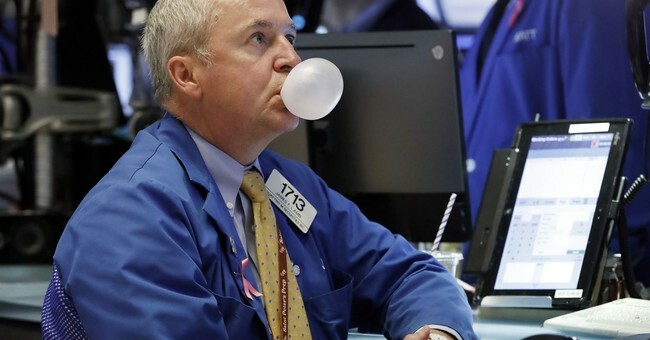 However, more than half of those gains were quickly reversed the following day as investors took a sober look at whether the Chinese government is starting to lose its grip on the economy. According to the Wall Street Journal, investments in Chinese factories and other fixed assets are at their lowest level in 18 years and China’s usually reliable household consumption is also beginning to decelerate sharply. China’s economy has been on a downward trajectory in the past few months, with auto and retail sales on the decline. Fixed-asset investment rose a mere 5.3% in the January-August period from a year earlier. It was the most lackluster growth rate since 1992. This was mostly a planned slowdown; an edict from the government that realized its economy was beginning to resemble a Ponzi scheme. What is very interesting is that this lethargic growth persisted even though companies have been gearing up for U.S. tariffs on Chinese products; hence, front-running purchases. Macquarie Capital Ltd. predicts that Chinese growth from exports will decline as much as 10% in the coming months. All this concern about decelerating growth is hindering China’s deleveraging plans that it promised to follow through on at the beginning of this year. According to the Financial Times, Chinese debt was in the range of 170% of Gross Domestic Product prior to the Great Recession. But in 2008, China responded to the financial crisis with a huge infrastructure program---building empty cities to the tune of 12.5% of GDP, the biggest ever peacetime stimulus. According to the Institute for International Finance, China’s gross debt has now exploded to over 300% of GDP. Bloomberg estimates the dollar amount of this debt—both public and private--at $34 trillion; others have it as high as $40 trillion. With a gigantic shadow banking system, this number is obfuscated by design. Adding to the problem is that much of the Chinese private debt is pledged with collateral from the stock market, which has been in free-fall this year. According to Reuters, more than 637 billion shares valued at $4.44 trillion yuan ($639.86 billion) were pledged for loans as of Oct. 12. As the air continues to pour out of the stock market, it will put additional pressure on the debt market. Most importantly, China’s debt binge was taken up in record time; soaring by over 2,000% in the past 18 years. And this earth shattering debt spree wasn’t used to generate productive assets. Rather, it was the non-productive, state-directed variety, which now requires a constant stream of new debt to pay off the maturing debt. Therefore, the schizophrenic communist party is caught between the absolute need to deleverage the economy; and at the same time, trying to maintain the growth mirage with additional stimulus measures. The stimulus provided thus far has managed to expand the amount of money in circulation, M2—a measure of the money supply that includes cash and most deposits—to 8.5% this year, from 8.1% last year. Yet, even with a large growth in the money supply, China has not been able to achieve its desired rate of growth because it is weighed down by its legacy of debt. Although this latest round of fiscal and monetary stimulus has not had the anticipated economic effect to date, it has produced a negative effect on the Chinese yuan. Leaving some to wonder if China is finally losing control over its currency. In August 2015, an unexpected devaluation in the yuan led to a capital flight as Chinese companies, citizens and investors sought to protect themselves from further declines in the currency. If the yuan weakens too quickly again—either naturally or by another planned devaluation—this would add even more chaos to the already fragile global markets. The yuan has fallen nearly 10% against the dollar since April ‘18. The Chinese are currently trying to keep the currency from falling below the key support level of seven to the dollar. The yuan hasn’t traded that low in more than a decade; but holding that line has become more difficult as China dances capriciously from deleveraging to massive stimulus measures. In order to defend the value of the Yuan, China has depleted much of its dollar reserves. A further yuan devaluation could panic the Asian block nations in a similar way as did the Thai baht back in 1998; Leading to mass devaluations and putting further downward pressure on emerging markets. But China isn’t the only wild card in the global growth deck of cards. Over in the Eurozone, Italy is brazenly threatening to move forward with a budget proposal that would obscenely breach the European Union’s budget guidelines. The bureaucrats in Brussels are threatening fines. But this doesn’t appear to be enough to inhibit the Italian government, which is intent on increasing social welfare programs, adding to pensions and giving workers a tax cut. These bold plans have led the rating agency Moody’s to downgrade Italy’s sovereign debt to one notch above junk. Uncertainty in Italy is a major geopolitical factor weighing on global sentiment. Investors are rightly concerned about the Rome-Brussels stand-off, given that Italy is the Eurozone’s third-largest economy and its debt is held by every major bank in Europe—and most in the U.S. As interest rates rise in Italy, the prospect of insolvency rises alongside. These global headwinds matter because as good as things may appear in the U.S. at the moment, China has accounted for nearly 30% of global growth. And with Emerging Markets and the European Union hanging in the balance, the synchronized global growth story is now ancient history. Point being, the U.S. economy does not exist on an island. This begs the salient question: How much lower will the growth rate of earnings be in 2019 for the S&P 500? Earnings growth in 2018 peaked at 25%. However, with the top global economies all rolling over, peak corporate margins, trade wars, the waning of repatriation and stock buybacks, soaring worldwide debt and trillion dollar U.S. deficits, mounting rate hikes from global central banks and a Fed that is destroying $600 billion this year through its reverse QE program, it is doubtful that there will by any earnings growth at all next year. Nevertheless, Wall Street Shills are still pricing in 10% earnings growth and slapping a big multiple on top of it. The surprise here is that earnings growth could very easily be negative next year. A sharp global slowdown coupled with a plunge in earnings growth won’t sit well with a market that is trading at 140% of undelying GDP—a rare altitude indeed. That is the real reason why the stock market is crashing…and why that crash is just getting underway.